It has been a good couple of days for Nacho Patrol. Not only have we joined the 21st Century by getting a Facebook Page and a Twitter (we still don’t know what @ or # means, but we hope to have it figured out by the time the next big social networking media hits the market), but we also enjoyed a wonderful night at The Rattlesnake courtesy of Brian Poe, Laura, and the trivia teams that were worse than us. In another news Nacho Patrol gets creative at Poe’s Kitchen? More news on that in a few days, but for now, we’ve got some reviewing to do! Appearance: (6) a little blah, and when you factor in the strange black stuff in the fried clams (we try to avoid eating filter feeders whenever possible) and the grayish color of the batter, we felt ourselves only slightly repulsed. Setting that aside, we thought the splash of color provided by the salsa offered a nice contrast to the creamy off-white chowder. Distribution: (7) We’d love for the Rattlesnake to pay a little more attention to distribution. With a mass of chips, it’s easy to end up with a situation in which the sauce takes over while the other ingredients fall to the wayside (or our bellies). There was certainly enough of everything (and by that we mean, not enough bacon), but it wasn’t where it mattered most. That is all we will say on the matter for this week. Quality: (6) Let’s preface this by saying, Nacho Patrol are fish people. We’ve been advocating for calamari and marinara on nachos since the dawn of time. Recently, we’ve been devising methods to put salmon and a delicious creamy dill sauce on chips. 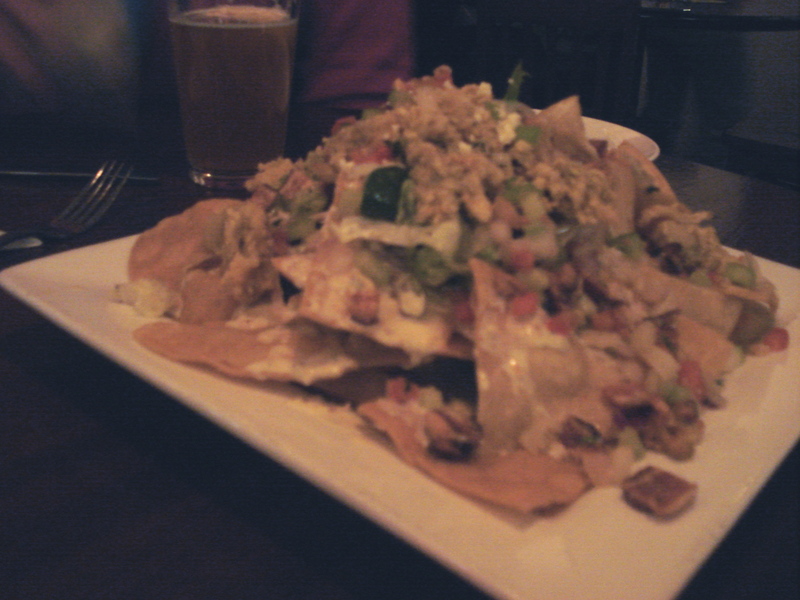 So, this isn’t a matter of saying, “well, they just don’t know how to eat fish.” Fried clams on nachos just didn’t work. They just aren’t flavorful enough to carry a nacho plate. On another note, we’re told the clam chowder at Rattlesnake is delicious–but with so many other flavors blended in it was hard to get an unadulterated look at the sauce. And as always, the salsa and vinaigrette could do us no wrong. If we had it our way, we’d put bacon on everything. Once again, a bottle of cholula was kept close at hand to compensate for the general lack of salt/flavor. Overall: 19/30. Our least favorite so far. But we have reason to be hopeful for next week….